A couple of interesting The Hobbit: An Unexpected Journey items for you today. First up, Richard Armitage has been getting plenty of attention for playing the "dreamy" dwarf Thorin Oakenshield in this Peter Jackson directed prequel. Now, you can own a replica of his sword, Orcrist, for only $199. (CLICK HERE). CB Swords has released a new photo of Thorin, along with the following description. "In Third Age of Middle-earth, Thorin Oakenshield and his Company of Dwarves came upon a troll lair in Rhûdaur. 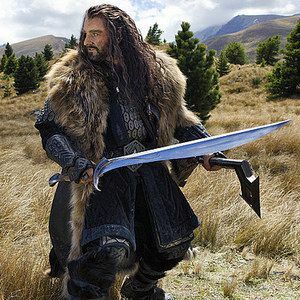 There Thorin found an ancient Elven sword named Orcrist, forged by the high Elves of the West, in Gondolin. Thorin claimed Orcrist for his own and vowed to cleave Goblins with it once again. He wielded the sword through most of the Quest for Erebor, using it against the Goblins of the Misty Mountains. The Goblins called it "Biter" and hated and feared it. Inscriptions on the sword in Elven runes: On the guard is the name Orcrist "Goblin-cleaver". Blade Inscription (both sides): "The serpent's tooth". In other The Hobbit: An Unexpected Journey news, theater owners and exhibitors are claiming, at this moment in time at least, that there will be no extra surcharge or premiums tacked onto screenings of the movie shown in 48 FPS. The question arose to concerns over the already-in-place surcharge on most 3D screenings, which add a couple of extra dollars to the 2D ticket price on all films. Since The Hobbit: An Unexpected Journey will be in both 3D and 48 FPS, many feared that even more money would be asked for a seat. (The 2D version of the film will not be screened at 48 FPS). Even with this early announcement of no surcharge, it is clear that theater owners will be required to invest in plenty of new technology to be able to show off 48 FPS films in their theater. It is up to them, not the studio, to decide if they will raise ticket prices. So this could all change very quickly. While a 48 FPS version of The Hobbit: An Unexpected Journey will be made available to all theaters in North America, only a select few will be prepared to present the movie in that format come December 14th. Only a handful of screens will actually be playing The Hobbit: An Unexpected Journey in 48 FPS, and most of those screens will be in New York and Los Angeles. And maybe one theater in Portland, Oregon. Trust us, if a theater near you has 48 FPS capability, you will be hearig about it.